Digital agencies love to combine web design and online marketing, but when it comes to website development most firms either outsource (to someone like us) or use website templates. Templates can be great, but they are not for everyone. Many current clients came to us after bad experiences with other agencies, only to find out that the larger problem was an incorrect or incomplete understanding of what web development actually is. After realizing that I too felt a bit lost trying to figure out web development, I did some research and spoke with my best web developer friend (my boss) Matt Mayernik to give you a general overview of web development – plus answer the most frequently asked question: the difference between website building tools (like WordPress or Drupal) and the custom web development work we do at Hudson. Before we get into website building, can you briefly explain web development? Basically, web development is the ‘how’ of everything that exists online. Websites, mobile apps, downloadable software – any interface that runs using the Internet. Really, it should be called technology development, but that’s another conversation. So, what do you do for clients? Web development starts with the specifications, meaning the things that differentiate one project from the next. I ask clients: what do you need to accomplish? What are your main goals? Based on those answers, I figure out which frameworks and functions will make those things happen most efficiently online. Then I create a few blueprints outlining my solution. Whether that solution comes in the form of a website, app, or a larger centralized system that will eventually act as the core for a number of interfaces depends entirely on that client’s needs. So...it's more than just websites? Correct. At the end of the day I’m a professional problem solver. Writing code is just a means to that end. Let’s say a client comes in and wants a website where purple elephants dance across the screen every time someone makes a purchase – as a web developer I’m the one who figures out how to make that happen. But let’s say it’s more complex. A business owner wants to build a website where his employees can log-in, track productivity, and communicate with other employees quickly and securely on the job. He’s not looking for just a website. He wants a digital business solution. OK. What is the difference between Hudson’s approach to web development and popular platforms like WordPress? Don't WordPress developers also take client needs into account? For starters, website building tools aren’t made to provide digital solutions. They are customizable to an extent, but trying to make them do certain functions is like putting a square peg in a round hole. You can get add-ons for functions like eCommerce integration, but not without sacrificing other things like site speed, security, and unique web design. Everything we make is built specifically for our clients from scratch. So the main difference is that our work is custom? Yes – always. We don’t use any website building tools, which is what differentiates the work we do from most web agencies, who take those tools and then work backwards to try to make them fit individual client requests. Plus, since our work is custom, clients don’t have to worry about the risks that come from using an open-source content management system (CMS). Remember how I said I create blueprints? Blueprints tell us exactly where everything is. It’s pretty much an in-depth map. Open-source website building tools like WordPress and Drupal make that blueprint public so web developers everywhere can use, improve, and add to those platforms. From a purely innovative development standpoint, it’s awesome because it means developers everywhere can create new add-ons all the time. But publicizing the complexities of a website’s foundation also means less security. I can’t tell you how many clients came to us specifically because their websites got hacked. In general, custom web development provides better security because it’s one-of-a-kind. Is custom web development best for larger businesses or corporations then? Since it’s more secure? Yes and no. From a security standpoint – absolutely. But any business with an online presence will benefit from a custom developed website. Some of our most successful clients were small or medium businesses. I would say the key is whether or not they intend on scaling up. Custom sites are most helpful for growing businesses – the size they start at doesn’t matter much. But to reiterate – I would never recommend that a large company use a website building tool. So, would you say the difference between Hudson’s approach to web development and other digital agencies’ is custom work, more security, and scalability? Yes. But taking it a step further, the main difference is that we help businesses leverage the web to not only increase sales, but also help internal operations run more smoothly. People hear ‘web development’ and assume it means simple website-building, which many times it does. But at its core, web development creates digital solutions to very real problems. Any other big differences between website building tools and custom web development that I should know about? One more thing. Our websites are built with search engine optimization (SEO) best practices in mind. For example, Google now takes responsive design into account when ranking websites, and all of our sites are responsive from day one. Responsive design means that everything we develop accommodates all screen sizes – whether desktop, smartphone, or tablet. So, if Sally Salesperson is out with customers and secures a sale, she can easily access her company’s order portal from her smartphone or iPad without worrying about functionality or distortion issues. It’s a business solution as well as an SEO best practice. Could you say responsive design is good for SEO because it’s good for users? Yes, exactly. A website which accommodates all screen sizes ranks higher because big search engines like Google know that mobile devices have completely taken over digital. Basically, keep up with the times and Google sees your website as customer-savvy and therefore more relevant. So you can’t leverage SEO on platforms like WordPress? You can, but it’s not the same. There are SEO add-ons for website building tools like WordPress, and on-page SEO efforts are still very important, but the difference is that our website structure (or blueprint) is built to maximize user-experience from the start. Google recognizes this as reputable since the whole point of search engines is for the most relevant, helpful websites to show up first. So to answer your question, you can leverage SEO on any website, but the custom-coded site has an advantage because it has the ability to keep up with all of Google’s wild algorithm updates. Got it. This has been really helpful. Thanks so much for chatting with me, Matt! Custom web development considers your business needs and goals from day one - website building tools simply can't do that. Custom web developers are problem solvers. Aside from making fully functional websites - they create digital business solutions. Custom web development improves SEO because it has the abillity to keep up with search engine algorithm changes. Lauren is the Director of Brand Strategy at Hudson. 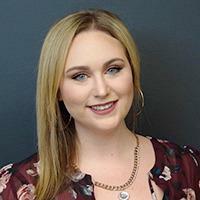 Utilizing her experience in sales strategy, market research, and years of creative and professional writing, Lauren is able to help brands tell stories that resonate with high value customers.